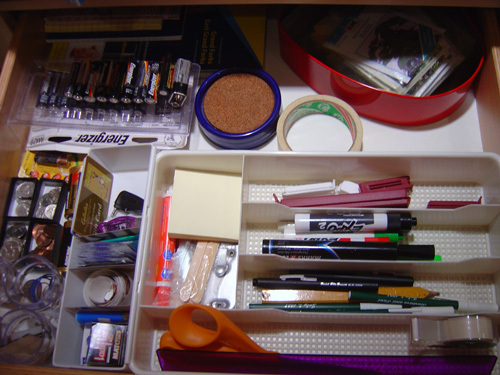 may not be the best person to write this post, because I don't have a single drawer that has fully transitioned to permanent organization solutions. If my make-shift solutions work, I don't change them. As much as I drool over gorgeously organized all matching solutions on HGTV or in magazines, I also think a lot of the items are ridiculously expensive and would rather spend my money traveling or just save it. However, if you do indeed implement a solution like cereal boxes, you will want something more permanent eventually. I have quite a few white plastic trays by Rubbermaid that I've used in various kitchen drawers for years. I like them because it doesn't matter what size drawer they end up in I can make them work. That's not always the case if you go with an all in one tray type solution. Change, grow and evolve as your needs do. Work for you, it should make your life easier, not just add to existing clutter. I use several of these trays in each drawer throughout my kitchen, bathroom and office. If you need a lot of small containers for things like safety pins, coins, buttons, erasers, matches, stamps, etc. 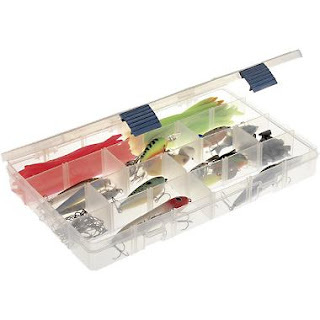 consider tackle box organizers. I know it sounds strange, but I use a tackle box for my first aid kit, because I can have any configuration of tiny spots for band-aid's, gauze, tape, etc. The lids can be removed so it can sit open in a drawer, or you can leave the lids on, but it's an extra step to open them and annoying if you have to get into it quite often. This tackle utility box is just $6 and you can see there are a lot of slots for dividers to slide into, so you can customize the fit your need quite easily. Don't limit yourself to a container/home goods type store when looking for permanent solutious, you'll usually find cheaper solutions at your local hardware and sporting goods stores. If you are curious, our first aid kit is similar to this 4-drawer tackle box. I also find that organizing "furniture" is fascinating but overpriced. If I have a bunch of small items that were very inexpensive (scrap/stamp supplies for example), I just can't justify spending hundreds of dollars to house it all. I also use tackle box inserts, which I bought when I was in direct sales and needed to organize a zillion cosmetic samples. They worked great for that, and they are fantastic as currently repurposed to hold buttons and eyelets, etc. I just have to make sure I don't ever have empties or hubby will snitch them. :) Hmmm Cereal boxes as organizers - maybe cross-cut to make magazine files for DD's collection of Seventeen issues!! She could decorate to her liking and set on her bookshelf and no one would be the wiser. I don't want to spend a lot on those and haven't really gone looking lately. Thanks for the inspiration! P. S. I think we need an Ikea, don't you? ?